Portsmouth, NH The AC Hotel by Marriott is on target for a late summer completion as PROCON crews finish up the exterior installations. The upscale hotel with an event center and a rooftop bar is located at 299 Vaughan St. adjacent to the 3S Artspace in the city’s North End. 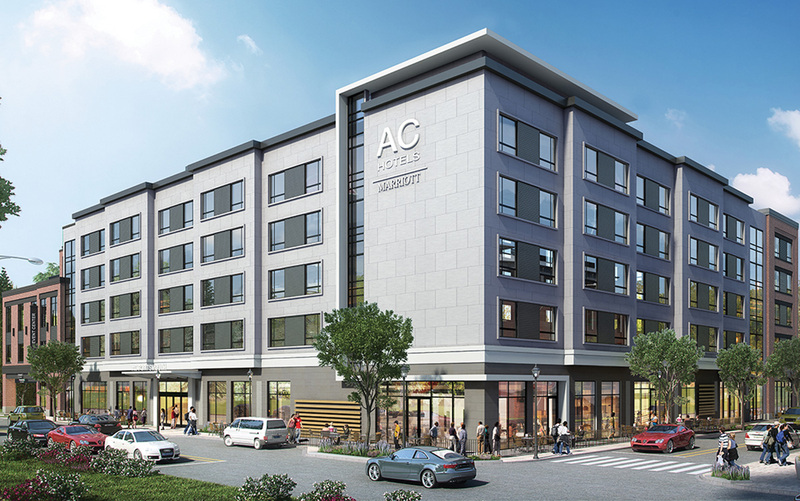 The 5-story structure will be the first AC branded hotel in New Hampshire. PROCON is the designer and construction manager on the project, which is a developer collaboration between XSS Hotels and Cathartes. The 154-key hotel design features double-queen and king guestrooms. Each room will include the AC’s signature wall-mounted workspace and seating bench. A European décor will be reflected throughout in finishes designed to appeal to tourists, business travelers and Millennials. Guest amenities will include a fitness center with a dedicated yoga room, a rooftop lounge/bar and deck, a library, a 24/7 market, complimentary WiFi, and a 24-hour business center. An additional 2,360 s/f of first-floor leasable office and retail space will also be available upon completion. In addition, the AC Hotel will feature a third floor 4,500 s/f event space and deck for weddings, special occasions, training seminars and more. The larger room will sub-divide into smaller meeting rooms for corporate meetings or intimate social functions. On the first floor, two media salons will provide collaborative technology and a 1,500 s/f sub-dividable conference area. Current work includes the roof installment, the weather-tight barrier and windows to be followed by interior installations.